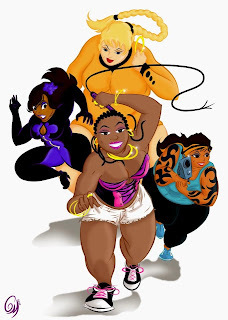 Chunky Girl Comics is breaking down barriers and introducing the world of comics to Rosie, Sage, Sweet Pea and Candy, a group of ladies with curves in all of the right places that are determined to break the standards of what a typical superhero should look like. They've been trying to build interest online and at convention over the past year or two. The comic isn't out yet, so I can't speak to whether or not this will be any good, but I want to highlight them for trying to put something out there that's different, at least in terms of how it depicts women. Whether you chalk up to hubris the fact that the characters are direct representations of the women themselves, or simply a convenient set of ready-made models for the artist(s), they certainly get lots of extra credit for cosplaying as their comic book alter egos when they attend conventions. That speaks to a healthy confidence in both themselves as well as their publishing venture. As I said, I don't know how good or bad the comic will be or, for that matter, if it ever indeed gets published. I certainly hope they'll have something out in the near future, and I hope it's really brilliant. But even if it isn't, it should act as encouragement to everyone else who doesn't see themselves represented in comics. If you can't find a hero that really speaks to you directly, one that you can't 100% identify with, then go ahead and create your own! Odds are, somebody else is having the same problem.